Intelius is trying to dip its toes into the public market again. Last year we wrote about their business, which combined for-pay people search information with a post transaction marketing scam. 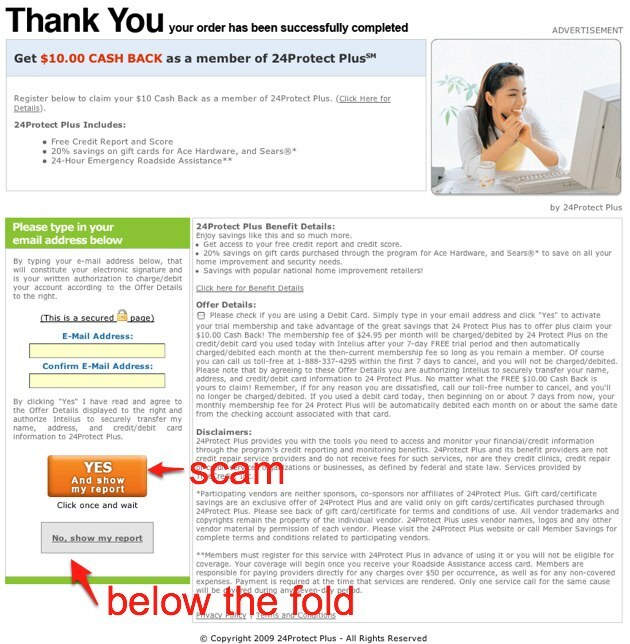 After purchasing people information, users were encouraged to take a survey for $10 cash back. In reality, if users clicked yes the $10 was never mentioned again and they were signed up for a nearly impossible to cancel $20 monthly credit card charge. The IPO never happened. But last week the company quietly filed a new registration statement with the SEC, indicating their attempt to try the markets once again. Little has changed with their business. They are still selling people information that you can find on other sites like WhitePages.com for free. And during and immediately after the transaction, users are asked if they want $10 cash back. If they click yes, they are signed up for a $25/month credit card subscription. Consumer complaints continue to flood the company. 1,159 consumer complaints have been filed with the Better Business Bureau in the last 36 months. There are another 214 complaints on RipoffReport. And they have had to deal with class action lawsuits in both Washington and California. And that’s just the tip of the iceberg. The company had revenues of $123 million in 2008 and $74 million in the first three quarters of 2009. Net income in 2008 was $12 million. Without the post transaction marketing scam, the company wouldn’t be profitable. 2008 PTM revenue was $33 million, or about 27% of total revenue. And that percentage is increasing – For 2009 so far, PTM revenue is $22.6 million, or 31% of total revenue. In my recent test searches I found that Intelius was charging even when there was no data (which you don’t see until you pay). And when the data is available, in all cases I was able to find it elsewhere for free. Intelius is not a business. It’s a huge toxic scam from start to finish.